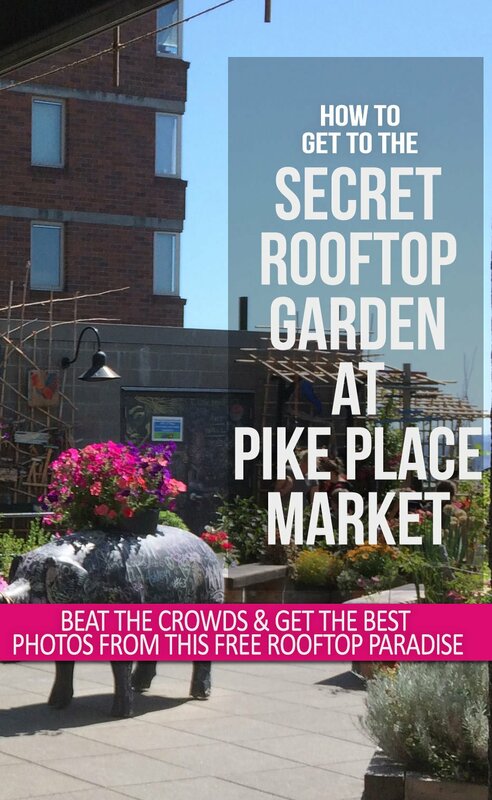 One of my favorite free things to do at Pike Place Market is missed by 99% of market visitors- it’s the rooftop urban garden, hidden around a few corners, just a few steps from Pike’s iconic entrance sign. 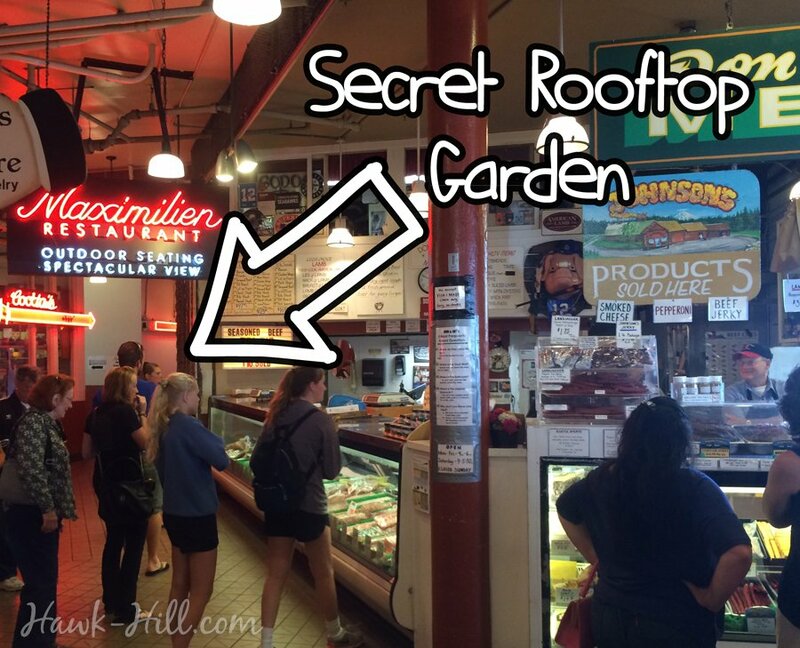 It made the list of my Local’s Guide to Pike Place Market, but directions to find it require a post of their own, if you aren’t familiar with the market. 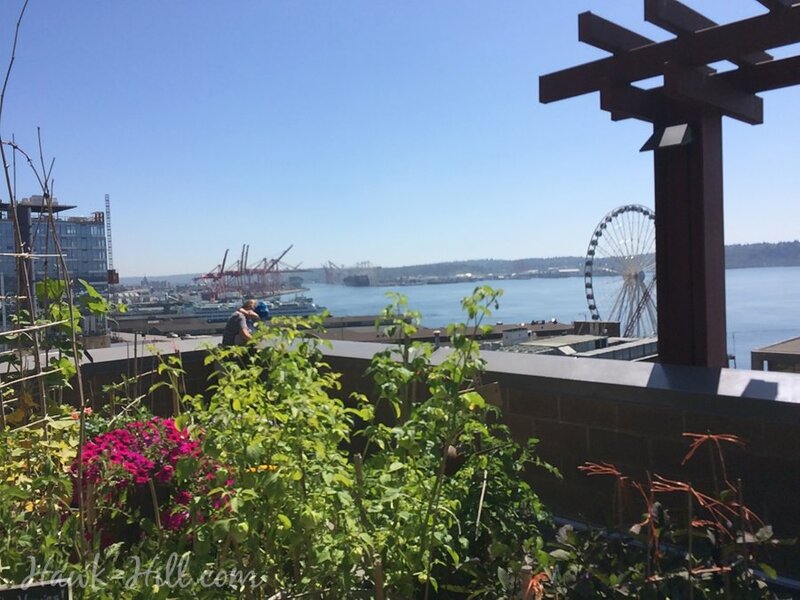 The rooftop garden at the market is a quiet reprieve from the noise and crowd of the market. Even in the peak of tourist season, this relatively unknown spot remains pretty quiet. It’s a great spot to take a picnic lunch, or to have a few moments of quiet amid the urban landscape. 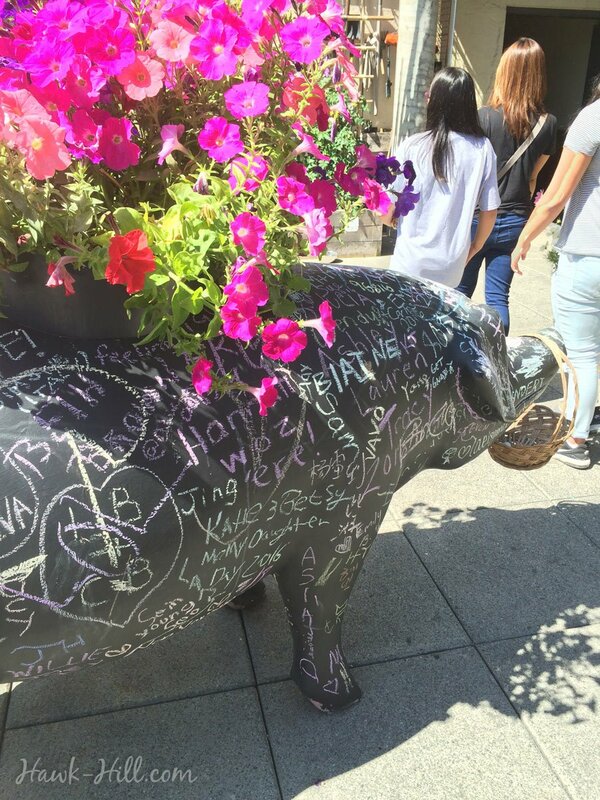 It’s a fun stop for kids- as chalk is provided to draw on the resident pig statue or a few designated walls. If you’re lucky, you might get to call dibs on one of their rocking chairs! Keep reading for more about what this garden is and how to find it. 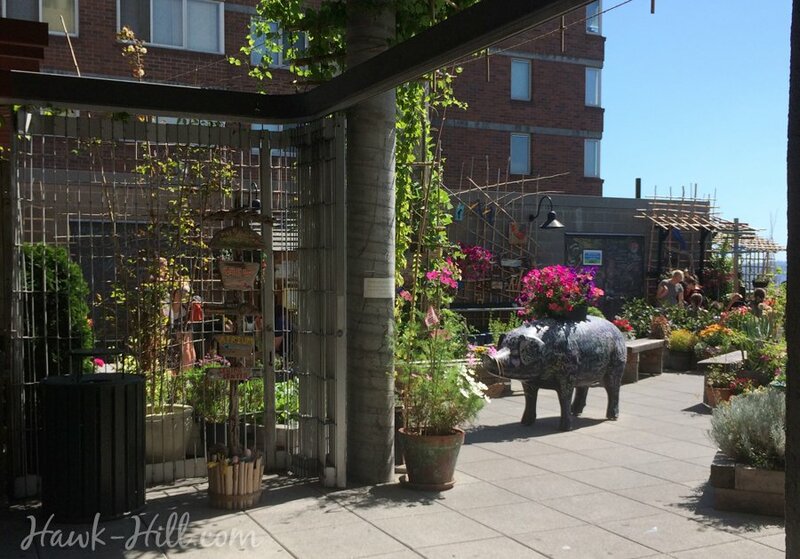 One of the many pig statues at Pike Place market, this porker is located in the community garden and welcomes artists young and old to doodle with chalk. Finding the community garden is really easy once you locate some iconic landmarks. 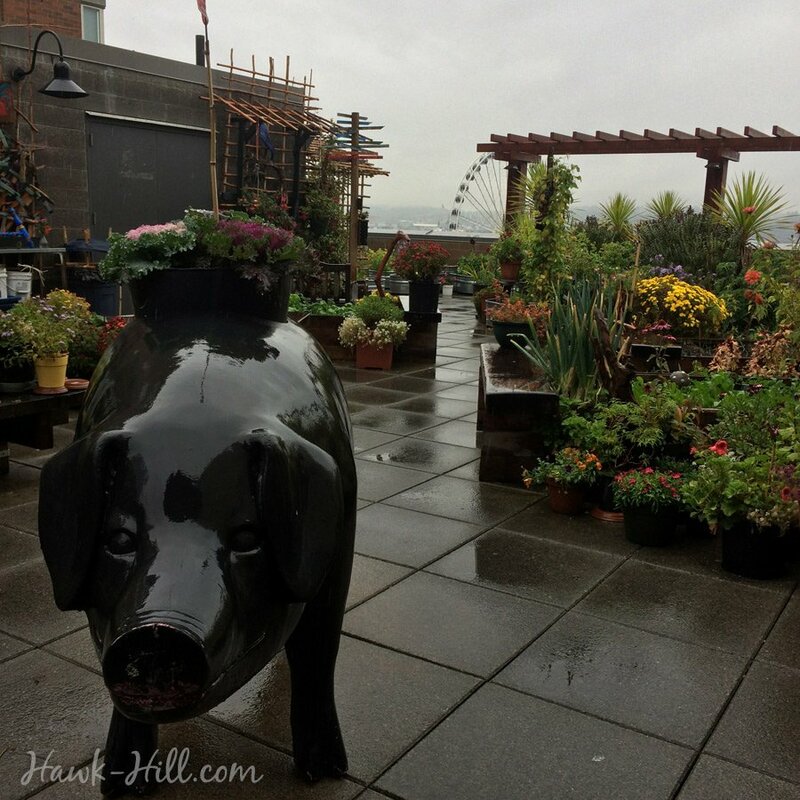 Pike Place Market is “L” shaped, with the fish throwers, iconic clock, and bronze pig statue located at the corner of the “L”. A few steps down this hallway, it meets another hallway on the left- turn left there. After turning left, the rooftop garden will be straight ahead. 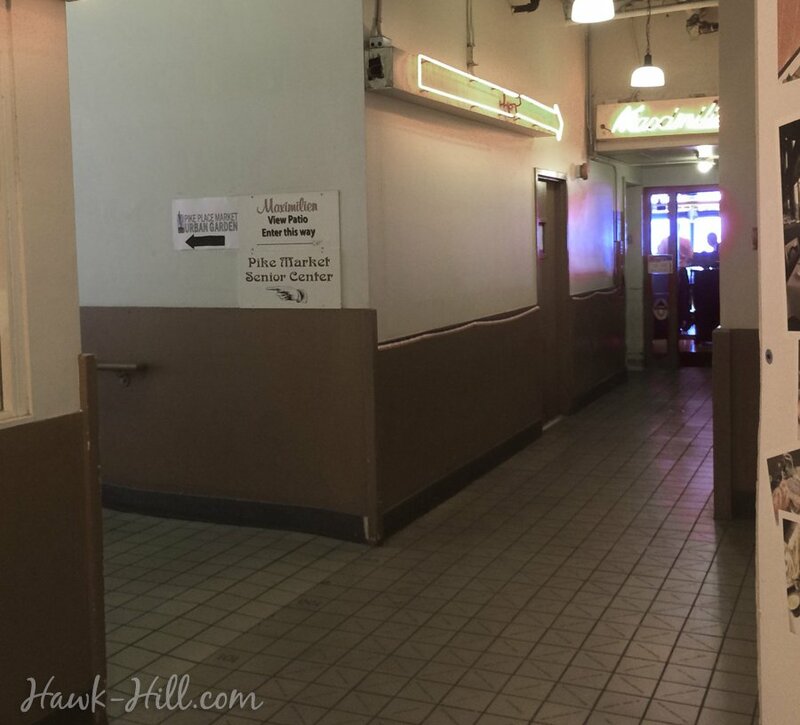 A lush scene is your reward for traversing the back hallways of Pike Place market. This photo was taken on a crowded day at the market during July- despite the crowd in the market I enjoyed near solitude in the public garden. The market garden has lots of fun and whimsical features, including water features, chalk-walls open to the public, art, mosaics, creative seating, and more. A particularly impressive feat since this lush garden is comprised entirely of containers and raised beds. 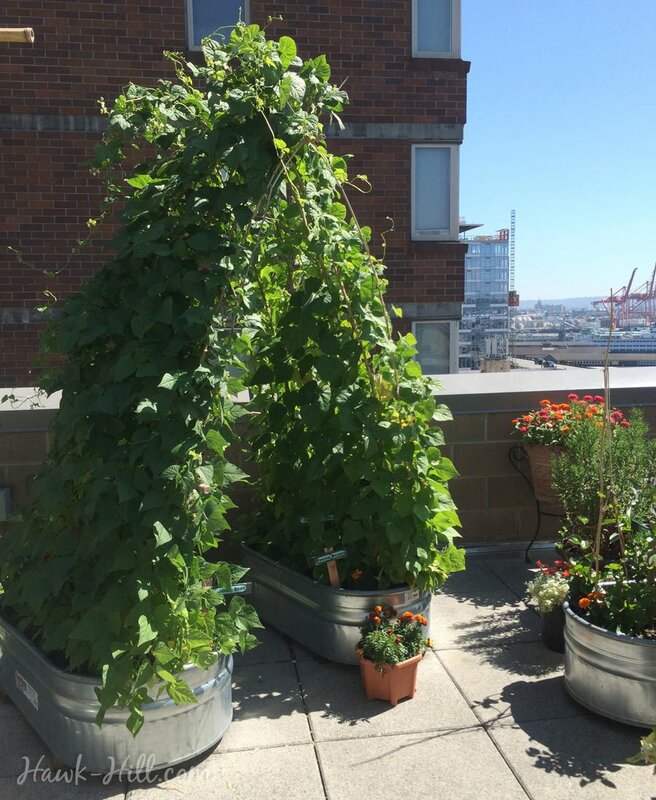 Vegetables are inter-planted with flowers and supply the food bank and Pike Place’s Senior Center. On a clear day, the views from this spot are unbeatable. The haze on this day hid Mt Rainier, but often visible is Mt Rainier to the left and the Olympic mountains to the Right, with views of miles of Puget Sound and beaches, the Seattle Waterfront, passing Washington State Ferries, cruise ships, and the ferris wheel always in view.